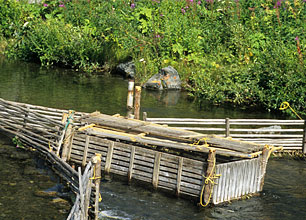 Tatchun Creek is considered to be a highly productive Chinook spawning stream. Salmon have not been enumerated in a consistent manner in the creek. The stock status is not monitored. Spawning habitat in the creek has been negatively affected by landslides. The Yukon River immediately downstream of the creek mouth is utilized by sports anglers. Pressure is highest during years when Yukon River flows are moderate or low and the shoreline is accessible. Angling includes catch and release plus retention when this is allowed. An unknown portion of the salmon captured are of Tatchun Creek origin.